There's something about warm pajamas that makes me want to scroll through Instagram. Even if it's late and I have work the next day, I'm never too tired to check up on my favorite personal trainers, poets, and, let's be real, the Kardashian-Jenners (the life of 1-year-old Stormi Webster is one I follow quite closely). 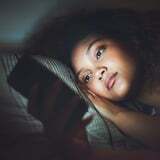 But here's some bad news: the blue light emitted by phone and computer screens can have a negative effect on your slumber because it suppresses the production of melatonin, a hormone that regulates sleep. Alon Avidan, MD, MPH, director of the UCLA Sleep Disorders Center, told POPSUGAR in a previous interview, "We find that a lot of people bring electronics into the bedroom and have the cellphone and all kinds of electronic devices that emit light, which tends to disrupt the sleep-and-wake cycle." To combat this, the National Sleep Foundation recommends turning off all devices an hour before bed, according to the Harvard Business Review. So, for six days, I decided to give it a try in the name of journalism. This meant that, no, I couldn't watch my beloved Vampire Diaries, browse trending Twitter news, or say hi to my girl Stormi. I went into it a skeptic but came out on the other side a believer. I'm a commuter. By the time I get home from NYC, I have so much I want to do (work out, eat dinner, shower, cuddle with my cat, watch Vampire Diaries) that in order to do it all, I need to stay awake past midnight. So, my hour-before-bed technology cutoff ended up being 11 p.m. on work nights. I made some adjustments to my routine. For one, I shortened calls with my boyfriend so they wouldn't run late. I also set up a daily reminder in my phone (of all things) to put it away, and I made sure I had a notebook and pen by my bed to write down what I was feeling (which turned into scribbles the heavier my eyes grew). So, what happened when the "Stop using your phone!!!" message popped onto my screen at 11 p.m.? I did what I'm ashamed to say I haven't done in months: I read. Part of me felt like I was offering up my phone like a sacrificial lamb at the slaughter. Surely I'd never see it again. There was an urgency in my fingers that drove me crazy at first - they needed to be doing something besides hold the hardcover spine of a book - but each day that I read Alanna Okun's The Curse of the Boyfriend Sweater: Essays on Crafting in place of internet scrolling, it got easier to ignore the urge to look up the author's Twitter handle and check my alarm for the 20th time (social media could wait and my alarm was set). Even after just one day, I noticed that I slept better, meaning I didn't get up as much during the night. I also seemed to melt into sleep as opposed to waiting anxiously for it. Reading at night with zero distractions somehow made sleep rush over me like waves. Normally it's something I have to chase after; it almost never comes to me so swiftly. I couldn't do it over the weekend. I just couldn't pull myself away from Vampire Diaries (the sexual tension between Elena and Damon was just too good). I felt restlessly wired by the end of my binge-watching, and I grew frustrated with how hard it was to completely fall asleep once I managed to tear myself away from the vampires. That being said, I'm glad I faltered. I was able to contrast these nights, when I stayed up until 2 a.m. with Elena Gilbert and the Salvatore brothers, with nights one through three, when sleep seemed easy. Reading made me feel calm; Netflix, though good for unwinding, kept my eyes open wide. Yes, I was unsuccessful Friday and Saturday, but I was excited to go phone-free once 11 p.m. came around that Sunday. For me, it was the most important night to put technology aside because of Sunday scaries, and the calm I later felt further confirmed that books made slumber come to me instead of vice versa. I didn't need to seek it out like I did on nights I was glued to a screen. Absolutely. I'd definitely benefit from unplugging before bed during the work week. It might be unrealistic to put down my phone and turn off Netflix a full hour prior to sleep, but I think lying comfortably with a book instead of scrolling through Instagram is a great practice to have. It's also unrealistic to say that I'm going to incorporate this into my bedtime routine on Friday and Saturday nights when I'm less concerned about waking up early the next day. Besides, weekends aren't as structured. But this experiment taught me that it's nice to put some space between myself and technology. So find a novel. Take out that sketch pad you haven't used in weeks. Try a series of new stretches. Stormi Webster (and, yes, even Vampire Diaries) can wait until the morning.